It is really mandatory to be a really good designer. We visit lots of websites daily and some of the design really attracts us very much. Just try to differentiate what’s there that gives you nice feeling . I think you will find it and can collect it to implement in you site also. In lots of cases I saw some designer makes a template very nice and he is very happy about it, which truely is an awesome design but the design is not appreciated or even accepted by the customer. Well the thing behind this my friend is that actually you didn’t made it the way the customer wanted. So its always important to keep a basic theme for a template. How it works! for example, you made a template with nice pink and floral theme which is really nice, can you sell it for a indutrial website? So two things to keep for theme “color” & “subject” another thing is also important that is Composition. This step makes your design implementation really easy. This step is not mandatory but it helps me a lot. 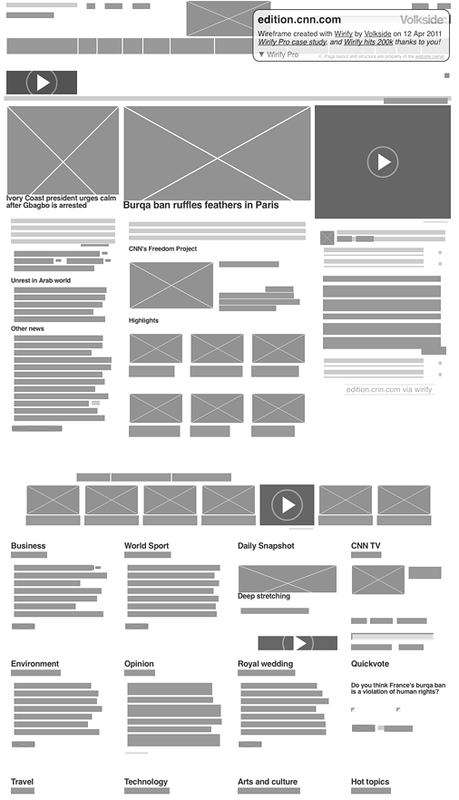 This is an example of CNN wireframe diagram. If we talk about web designer always the thing comes first is Adobe Photoshop. You can find thousands of photoshop tutorials here http://www.tutorialized.com/tutorials/Photoshop/1. While using photoshop use layer by layer design. Also Group the layers that are for same purpose(for example: its really helps if you put all of your most visited areas design component in same group). Don’t get confused with others criticism(different people have different choices) but give value to any sugession.